The 25th of November – Where is Winter? So What’s Happenin” in the Garden? 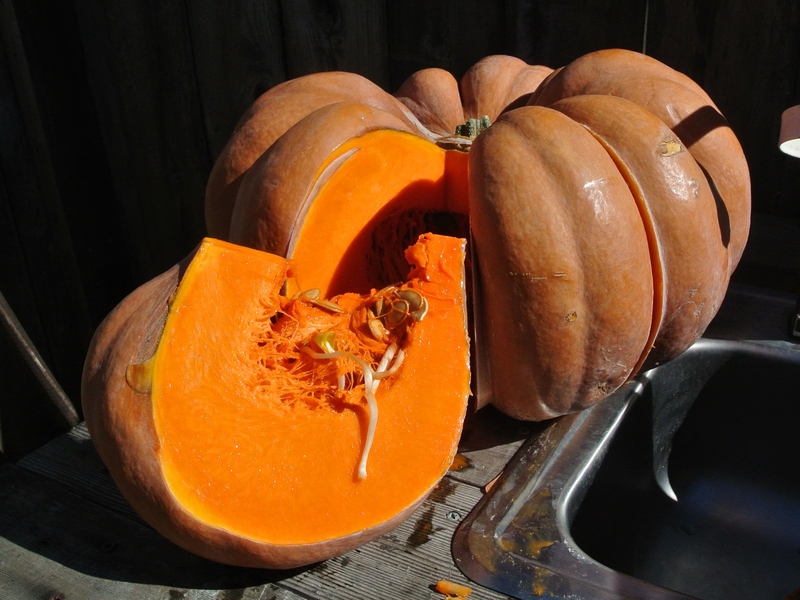 I took one of the house decorations, a large Cinderella Pumpkin (Rouge Vif d’Etampes), cut it into segments and baked it. 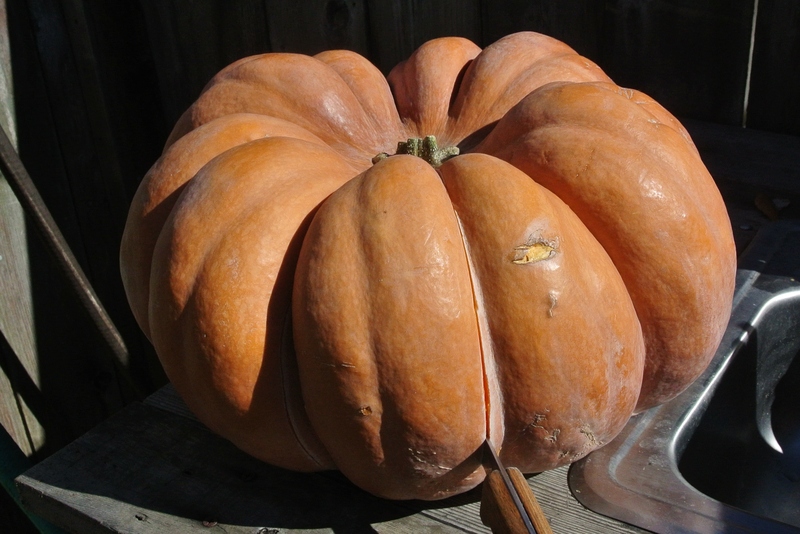 This pumpkin is a French heirloom that was introduced to the US around 1883. It is flat in shape and deeply lobed. Normally the pumpkins gracing our fall decorating are dealt with once they become mushy, ooze and attract fruit flies. Not a total loss, they always wound up in the compost bins. Through my blogging and blog reading I have discovered that folks still take the time to actually use pumpkins as a wonderful addition to the table. It is a bit of work but the aromas and flavors are awesome. It starts with dismantling the pumpkin. Out on my garden bench, I make the first cuts using the lobes as guides. The color of the flesh is stunning. 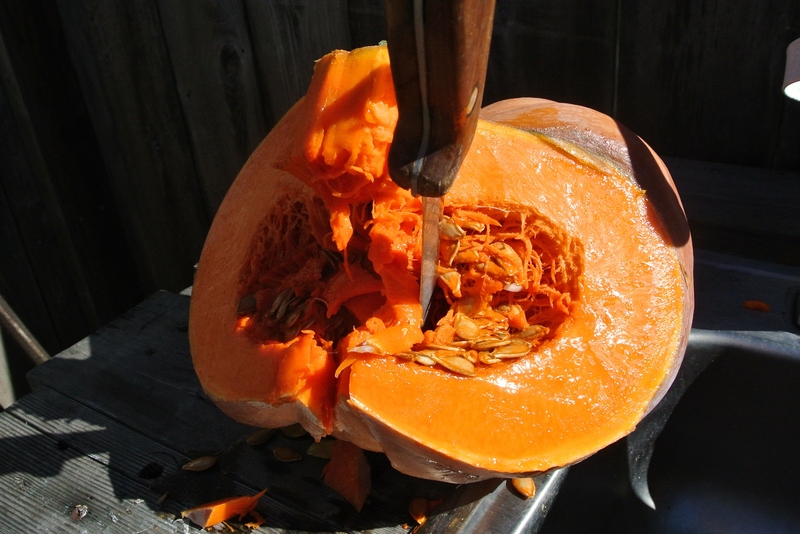 Sections cut prior to scrapping out the seeds. I noticed that some of the seeds had begun to sprout. 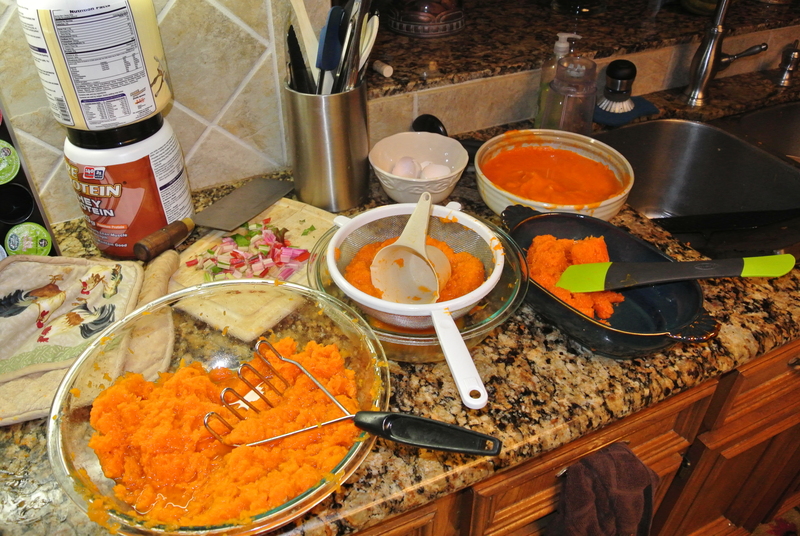 The surgery produced 10 lobes of the deep orange flesh for baking. Once cut and the seeds were removed I moved the cut up sections into the kitchen. 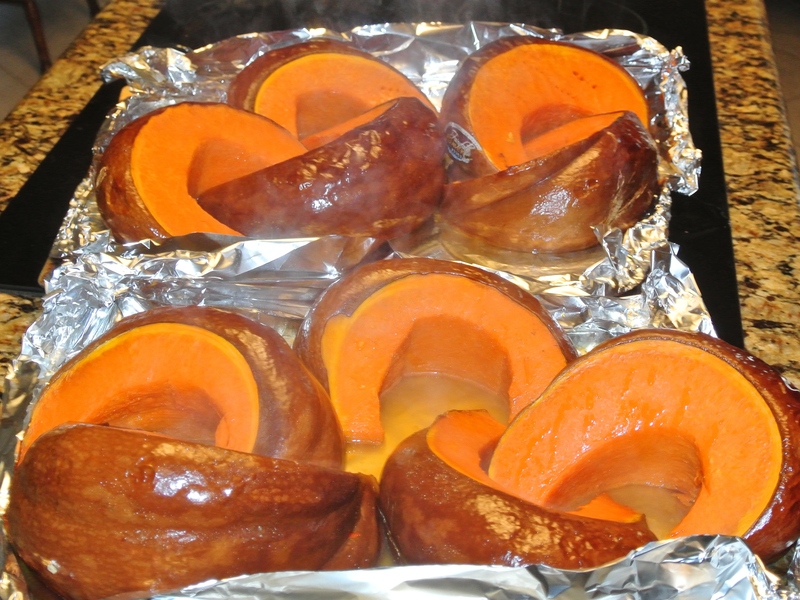 I made shallow lipped trays with foil to catch the fluids and placed the foil and sections of pumpkin onto cookie sheets. They baked at 350 deg. F for about an hour and 45 minutes. I removed the sections and cooled them on wire racks until cool enough to handle. Fresh out of the oven, steaming and smelling so good! Pardon the mess on the kitchen counter – I promise to clean my mess up! Cut into chunks, mashed, puree mode in the blender and allowed to sit in the sieve to drain off the free water. Four cups of the puree were put to use immediately in the form of a pumpkin pie. It is sitting on the rack cooling as I write. I am so looking forward to tasting the ultimately fresh pumpkin pie! I think I still have about 5 quarts of pumpkin puree to deal with. I am told that it freezes well. I see some pumpkin bread in the near future and maybe a pumpkin ale! That sounds very tasty! FYI – the pumpkin ale was brewed this past weekend!